ፌደራል ፖሊስ በተለያዩ ከባድ የሙስና ወንጅሎች የተጠረጠሩ ባለስልጣናትን በቁጥጥር ስር አዋለ! ፌደራል ፖሊስ ከ 61 በላይ ባለስልጣናትን በቁጥጥር ስር አዋለ! Federal Police have arrested Yigezu Daba, director general of the Public Procurement & Property Disposal Service and 60 other government officials on suspicion of corruption and economic sabotage. 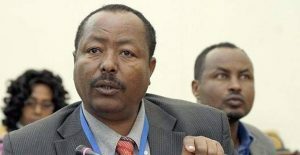 Officials from the then Ministry of Finance, Economics & Cooperation, the Public Procurement & Property Disposal Service, the Food & Drug Administration Agency, the Pharmaceuticals Fund & Supply Agency and the Ethiopian Water Works Construction Enterprise were also arrested yesterday, April 11, 2019, by a police operation that began early in the morning. The Office of the Attorney General is expected to give a press conference late in the afternoon today.